Patrick Connaughton did not have a Division-I basketball offer prior to July. On Saturday, he completed his meteoric rise with a commitment to Notre Dame. 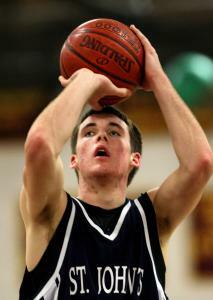 Connaughton, a 6-foot-5 swingman from St. John’s Prep (Mass.) who played on the AAU circuit with Middlesex Magic, is also a star baseball player. He said his ability to play both sports at Notre Dame contributed greatly to his decision. Connaughton chose the Fighting Irish over Boston College, UCLA, Miami (Fl.) and Vanderbilt. Before Connaughton blew up at the AAU Nationals in Florida, there was little chance he would be committing to play basketball at a high-major school. In fact, Notre Dame was the only team that even keeping an eye on him. Connaughton is also excellent in the classroom, as he sports a 3.6 GPA and is a member of the National Honor Society. Balancing two sports and academics might be difficult for some, but Connaughton does it just fine. On the court, Connaughton is a tough player with solid athleticism and a versatile offensive game. Head coach Mike Brey’s hard work paid off with Connaughton, and he had to be excited about his first 2011 recruit.